Mom left me and my sisters alone for Thanksgiving. She didn't even bring us back any turkey. We love turkey, even if she doesn't. We would've loved to have some leftover turkey, I'm still mad at her. Grrrr. We have a big event planned for this Saturday, December 1, 2018. 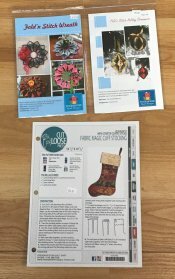 First, starting at 10am is our FREE PATTERN AND DEMO DAY! From 11am-1pm, the WIGGLE MONEY TREE AND RADIO REMOTE be here at the Shop. 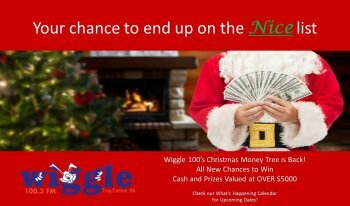 You can sign up for a chance at winning some cash from the WIGGLE MONEY TREE! Our PICK YOUR DISCOUNT ORNAMENT TREE will up. Pick your ornament, do a little shopping and we will open your ornament at the register to see how big of a discount you will receive. While at the Shop, sign up for a chance at winning a $25.00 Gift Certificate. 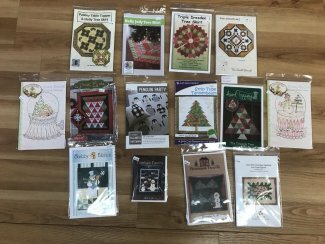 We have a large selection of Christmas patterns for tree skirts, runners, toppers and more in stock. 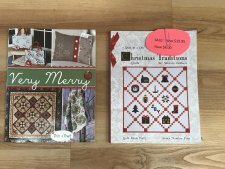 We have a couple of Christmas themed project books in stock. One is even on sale! 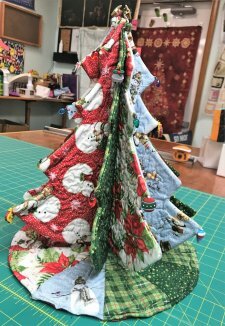 The Tabletop Tannenbaum pattern and batting is back in stock! This has been a wildly popular pattern. It just keeps flying off the shelves. Don't forget the tree light and ornament buttons to decorate it with. Now, how about your Christmas list? Wouldn't you love a sewing machine trolley that can fit your sewing machine and a lot of your fabrics, notions and projects to take with you to Quilt Retreats? 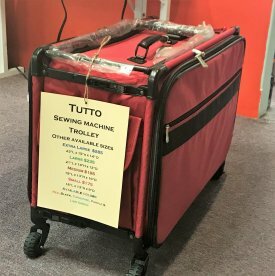 We have the 2XL Tutto sewing machine trolley in stock. It's big enough to fit most everything for Quilt Retreat in. That means less bags to carry and trip over at Quilt Retreat. 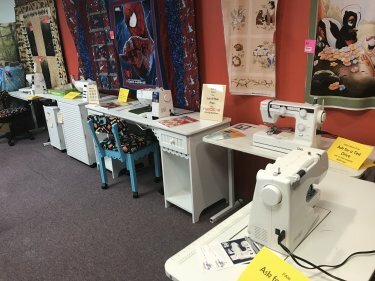 Maybe you need a new sewing machine for Christmas. We are a Necchi Dealer with 5 sewing machine models on display. We are an Arrows Cabinet and Chairs Dealer. We can have your Arrows Cabinet and/or Chair delivered here to our Shop or have it shipped directly to you home. Check out our Special Prices on our Display Models. Can't decide, we always have Gift Certificates available. If you like, you can drop off a wish list and we can give it to your family when they come in to find the perfect Christmas gift for you. WE WILL BE CLOSING AT 12 NOON ON DECEMBER 24. WE WILL CLOSED DECEMBER 25 TO CELEBRATE CHRISTMAS. WE WILL BE CLOSED FOR INVENTORY DECEMBER 26-JANUARY 2, 2019. Mom asked me to mention to everyone that she's sorry she's running behind on getting sewing machines serviced/repaired. 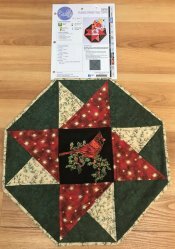 She will contact anyone with a sewing machine here as soon as she can get it finished. Mom is fighting a bad sinus infection. She can't take anything to relieve her symptoms as she has a bad reaction to over the counter relief medicines. It's really slowing her down. Hopefully, her antibiotics will kick out her infection soon. My sisters and I are doing our best to take care of her. Unfortunately, we don't have thumbs so all we can do is comfort her and keep her warm by snuggling with her. She seems happy with what we can do for her. We hope everyone has a MERRY CHRISTMAS and a SAFE & HAPPY NEW YEAR!